Southern Atelier’s biggest fundraising event is coming! Put March 30th, 7–11pm, on your calendar and prepare to enjoy a fun night of food, dancing, mystery art sales, auctions and some surprises. You won’t want to miss it. 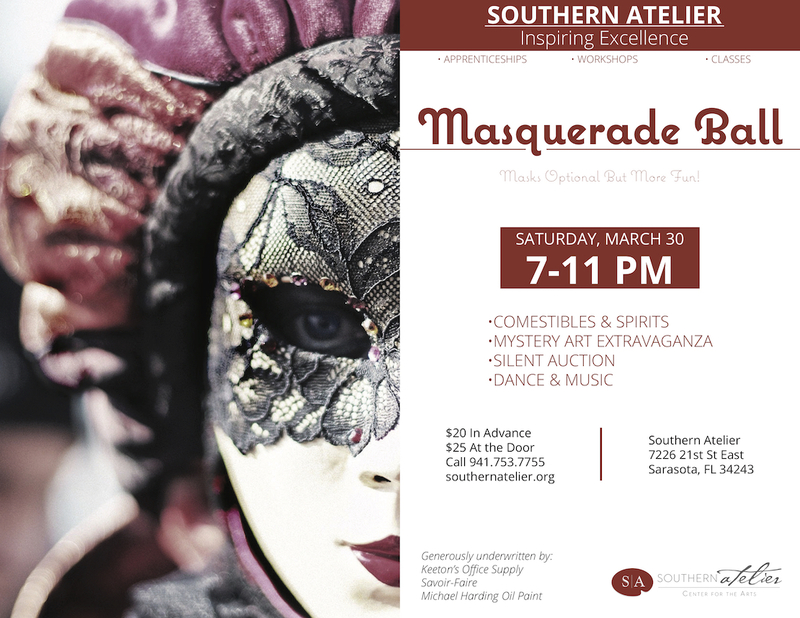 The Masquerade Ball at Southern Atelier has become a legendary gathering of artists from across the region. Join painters, dancers and musicians for this extraordinary costumed event. Proceeds will help support this wonderful community of Artists. Come in disguise for mystery and delight. But even if you don’t wear a mask, we will still have plenty of ways to revel and make merry. Visit our web site to purchase tickets in advance for $20 and at the door for $25. If you would like to become a sponsor or make a donation to help our Masquerade Ball, please contact Mary Louise O’Connell (mloc1552@gmail.com).